This little card is perfect for my son's birthday as he's going away and so won't be wanting heaps of cards but he's 18 and so I wanted to give him something nice instead of just handing over a gift card and this seemed the perfect solution. It is quite small too so uses up just a little bit of your stash and there is no complexity to it at all. 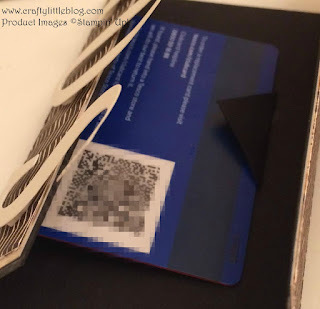 I just took at 5 x 6 inch piece of basic black card stock and scored it on the long side at 1.5 inches and 4.5 inches then burnished the folds so that it closed like a gate. Inside I glued two little squares of Basic Black which I'd folded into triangle to just slot a gift card into. I've used my Tesco Club Card here just for illustration. Then I took the Champagne foil card stock from the new Autumn and Winter 2017 catalogue from Stampin' Up! and making it just a quarter inch smaller than the front of the card I cut two strips of 4.75 and 1.25 inches and glued them on to the flaps using Tombow liquid adhesive. I used Champagne foil as it's so subtle and really understated for a man's card and it works so well with the DSP I chose to use on top of it. This is one of the designs from the new Painted Autumn DSP stack also in the new catalogue. I like that this paper is so versatile and has quite an ethnic feel to it which I like. 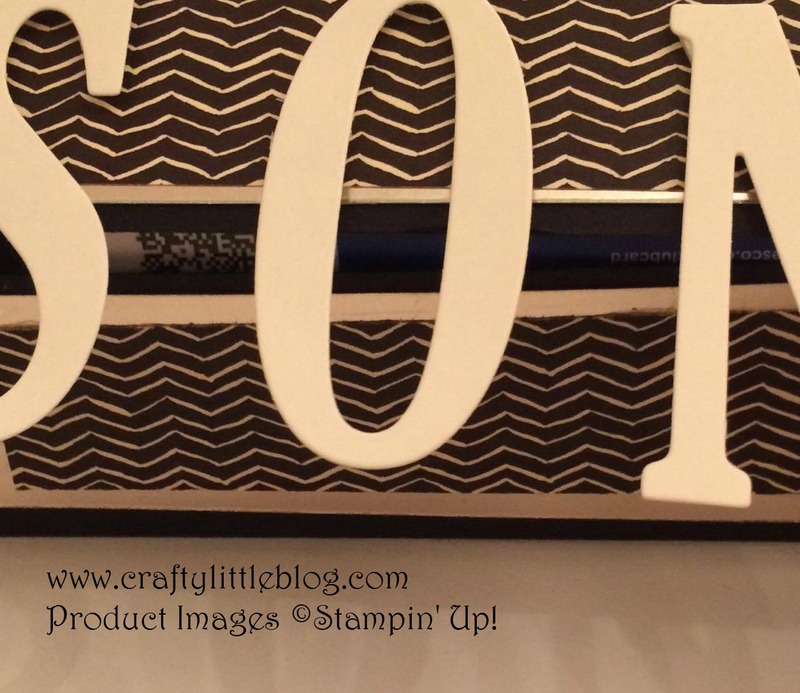 I often feel that Stampin' Up! papers remind me of places around the globe and this just makes me think of carvings I've seen on wooden ornamentals and shields from some African countries. I added two strips again making them a quarter inch smaller than the Champagne foil so these measured 4.5 x 1 inch. I glued these on with Tombow too. 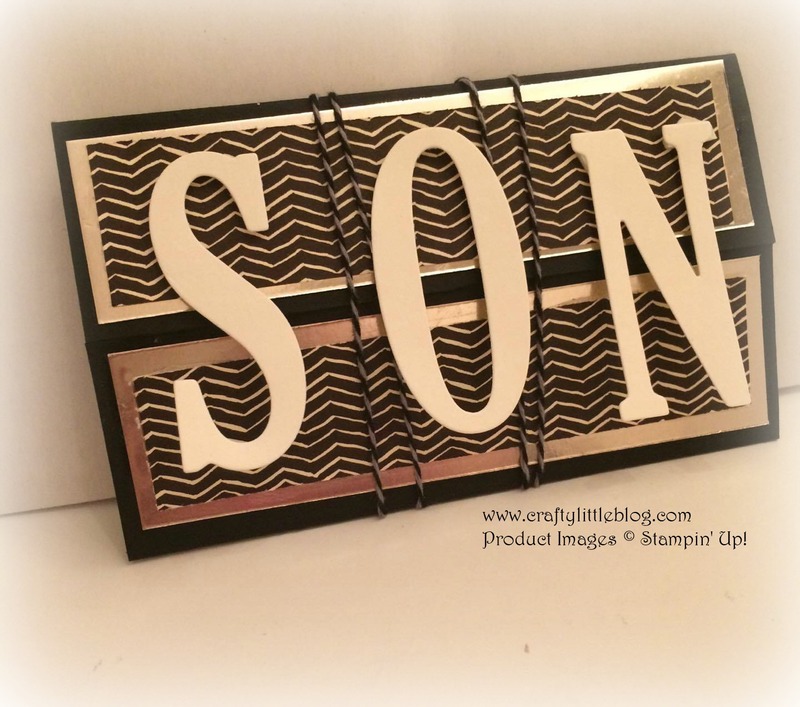 To finish off I added the word "SON" using letters cut from Stampin' Up! large letter dies using Very Vanilla card stock. I fixed these using mini stampin dimensionals just at the top section of the card so that it could be opened and left the bottom free, it gave the letters some dimension and I quite liked the free floating effect. To complete the card and keep it closed I took some bakers twine in Basic Black and Smoky Slate which is retired but was available on the Stampin' Up! Clearance Rack at the time of writing this post. I simply wrapped it around a couple of times making sure it sat either side of the letter 'O' and then just tied it in a bow at the back. So simple and yet so stylish and perfect to hand over a gift card in to a young (or old) man. I really do love this combination of cardstocks and DSP it has inspired me to make an elegant box for a lady's gift so watch out for that coming soon. Thanks for dropping in. and do click around the links below and check out the other designs submitted for September. Simple but quite elegant and it has my mind going crazy with ideas now I've broken open another DSP pack.